My research spans classical fluid dynamics theory and experimental microfluidics involving multi-physics heat and mass transfer, with an emphasis on numerical simulations. The applications of my research range from the measurement and manipulation of particles and biomaterials for applications such as separations, detection, sorting, and filtration, to classical fluid dynamics theory for flow in bends and branching junctions. Some other projects that I have studied include modeling and predicting biophysical flow conditions, designing novel devices for measuring the electrokinetic potentials of particles and surfaces, and engineering new systems for efficient evaporative cooling and/or water purification. 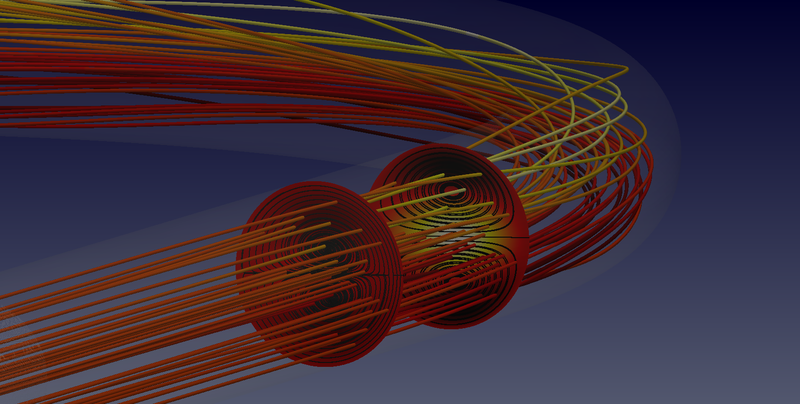 I use experiments and numerical simulations to study the nonlinear vortex breakdown phenomenon. We recently discovered recirculation zones in simple branching junctions that have all the classical signatures of vortex breakdown. I use simulations to study how these features originate and evolve as flow properties change. I also use experiments to study how these vortex breakdown recirculation zones interact with bubbles and particles in multi-phase flows. I especially study the effects of geometry on the dynamical flow features and how flow conditions can be used to maximize or eliminate particle/bubble capture in these zones (Video). 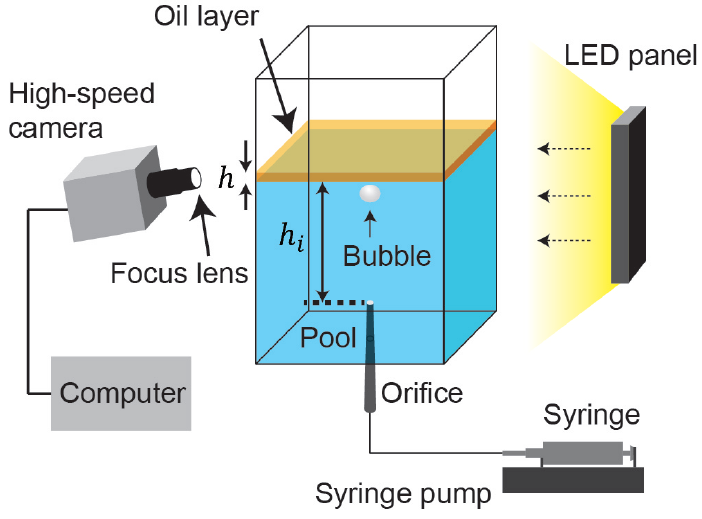 I am also interested in the practical applications of this new capture mechanisms and recently demonstrated a shear-induced rapid technique for producing large lipid vesicles using this vortex trapping. 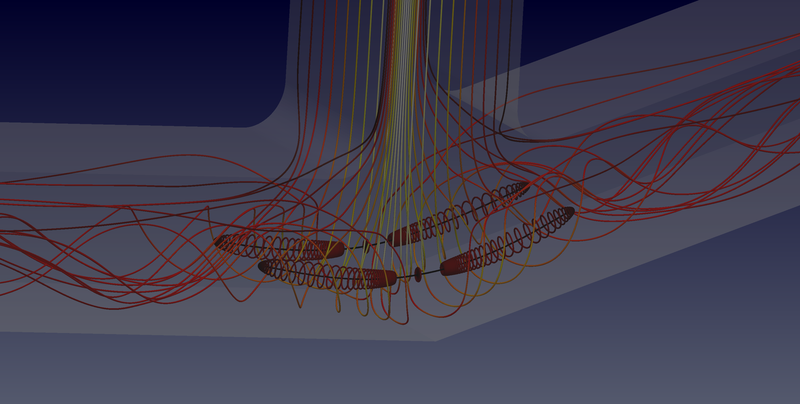 More recently, we combined numerical simulations and an analytical particle-tracking approach to show that inertial particles are captured in branching junctions due to invisible, anchor-shaped three-dimensional flow structures that define trapping regions for the flow. We also identified parameter regimes for which particles of certain sizes and densities will be captured. Finally, we introduced a mathematical technique for identifying locations where particles will accumulate based on the well-known Q-criterion. *Oettinger, D., Ault, J. T., Stone, H. A., and Haller, G. Invisible anchors trap particles in branching junctions. Physical Review Letters (2018), vol. 121, no. 5, pp. 054502. *Featured as Editor's Suggestion. Ault, J. T., Fani, A., Chen, K. K., Shin. S., Gallaire, F., and Stone, H. A. Vortex-breakdown-induced particle capture in branching junctions. Physical Review Letters (2016), vol. 117, no. 8, pp. 1-5. Shin., S.*, Ault, J. T.*, and Stone, H. A. Flow-driven rapid vesicle fusion via vortex trapping. Langmuir (2015), vol. 31, pp. 7178-7182. *The authors contributed equally to this work. A major focus of my research recently has been the measurement and manipulation of particles and biomaterials by diffusiophoresis and diffusioosmosis. For example, I recently developed theory and simulations to describe the diffusiophoretic dynamics of suspended colloidal particles in narrow channel flows and developed a system that can isolate, sort, detect, and separate particle and biomaterial suspensions by surface charge. These results will serve as the basis for new particle manipulation and measurement technologies. Along these lines, we also developed a system to rapidly concentrate colloidal particles in a microfluidic system in the vicinity of a junction. These dynamics are driven by local gradients in solute concentration when two flows with different concentrations merge. These results have applications for isolating and rapidly focusing particles, for example as a tool for preconcentrating biomolecules for rapid bioassays. I also developed 3D simulations for this system to probe the influence of secondary effects due to diffusioosmosis and their role in driving particles toward the channel walls. More recently, based on the success of these methods, we have begun to explore the possibility of using diffusiophoresis to separate, isolate, focus, and detect specific particles or biomaterials, specifically proteins. I am currently developing non-equilibrium molecular dynamics simulations to investigate protein dynamics in the presence of local solute gradients. With these simulations, I hope to develop a non-equilibrium molecular dynamics approach to measuring the diffusiophoretic mobilities of proteins, thus enabling the use of our other systems to facilitate protein separations and detections. Ault, J. T., Shin, S., and Stone, H. A. Diffusiophoresis in narrow channel flows. Journal of Fluid Mechanics (2018), vol. 854, pp. 420-448. 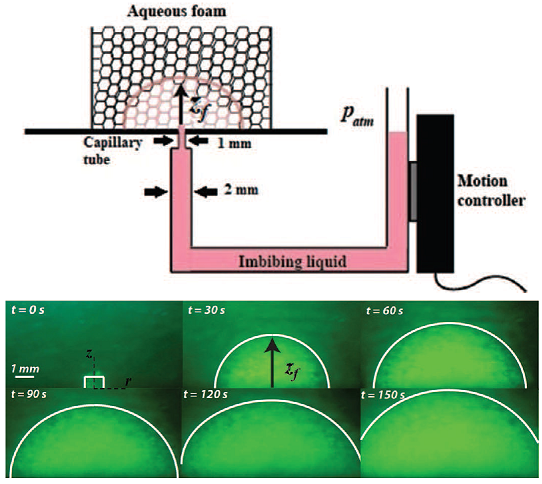 Shin, S., Ault, J. T., Warren, P. B., and Stone, H. A. Accumulation of colloidal particles in flow junctions induced by fluid flow and diffusiophoresis. Physical Review X (2017), vol. 7, no. 4. Ault, J. T., Ma, H., Bhowmik, D., and Shin, S. Diffusiophoretic mobility measurements of proteins by non-equilibrium molecular dynamics simulations. In preparation. My research has also emphasized the theoretical, numerical, and experimental investigation of suspended colloidal particles in confined geometries in the presence of solute concentration gradients. These gradients induce electrokinetic effects such as diffusiophoresis and diffusioosmosis that can result in surprising particle dynamics. For example, we discovered that solute concentration gradients can drive diffusiophoretic particle motions into or out of dead-end pores over significantly faster time scales than simple Brownian motion. Later, I developed numerical and analytical techniques to approximate these particle/solute/fluid dynamics with a simple 1D model using similarity transformations and asymptotic methods. For example, I showed that the method of characteristics can be used to quickly estimate the formation and motion of a propagating front of particles in dead-end pore geometries. These results inform the design of applications for enhanced particle injection and withdrawal from pores such as targeted drug delivery or cleaning applications. Finally, with the use of applied solute concentration gradients, we developed the dead-end pore geometry into a low-cost platform for zeta potentiometry of both colloidal particles and microfluidic channel surfaces. The method uses solute gradients to induce particle and fluid motions in the pore via diffusiophoresis and diffusioosmosis, both of which are sensitive to the zeta potentials of the particles and the walls. Thus, by tracking the particle dynamics with a microscope, both zeta potentials can be determined independently. Shin, S., Um, E., Sabass, B., Ault, J. T., Rahimi, M., Warren, P. B., and Stone, H. A. Size-dependent control of colloid transport via solute gradients in dead-end channels. Proceedings of the National Academy of Sciences (2016), vol. 113, no. 2, pp. 257-261. Shin, S., Ault, J. T., Feng, J., Warren, P. B., and Stone, H. A. Low-cost zeta potentiometry using solute gradients. Advanced Materials (2017), vol. 29, no. 30. Ault, J. T., Warren, P. B., Shin, S., and Stone, H. A. Diffusiophoresis in one-dimensional solute gradients. Soft Matter (2017), vol. 13, no. 47, pp. 9015-9023. Another project that is of current interest to me is the finite length effects of sliding rods near solid boundaries. Two-dimensional results are well-known for a cylinder sliding/rotating passed a flat, solid boundary, but the end effects for a finite-length, three-dimensional rod have not been investigated. I am developing 3D numerical simulations to solve the Stokes flow of finite cylindrical rods sliding and rotating near solid boundaries, from which the calculated mobility matrix can be used to recover the torque-free angular rotation rates for sliding rods. Ault, J. T., Rallabandi, B., and Stone, H. A. Finite length effects of sliding rods near solid boundaries. In preparation. Another focus area of my research is on the vortex breakdown phenomenon in internal swirling flows and the associated stability characteristics of such flows. For example, I have recently used high-resolution 3D numerical simulations to explore the stability of steady and oscillatory flow solutions in a swirling micro-mixer. Through this work I discovered a novel unsteady-steady-unsteady transition at moderate Reynolds numbers as well as a region of tri-stability where three distinct, independent flow solutions are all stable. These results can inform the design of microfluidic mixing applications as well as improve our understanding of classical vortex breakdown dynamics in confined systems. Chan, S. T.*, Ault, J. T.*, Haward, S. J., and Shen, A. Q. Unsteady-steady transition and tri-stability in a microfluidic swirling flow. In preparation. *The authors contributed equally to this work. Previously, I also studied the dynamics of an air bubble bouncing at a compound liquid/liquid/gas interface. The presence of an oil layer affects the interfacial properties, and thus modifies the entire bubble bouncing/bursting process. Specifically, we experimentally studied the bubble/fluid motions during bubble bouncing for a range of oil layer viscosities, thickness, and surface tensions. We also explored the influence of bubble size and approach velocity. I specifically developed reduced-order coupled mass-spring-damper models to describe bubble bouncing at a compound interface which accurately predicts both the contact time and coefficient of restitution of the first bubble bounce. Feng, J., Muradoglu, M., Kim, H., Ault, J. T., and Stone, H. A. Dynamics of a bubble bouncing at a liquid/liquid/gas interface. Jounral of Fluid Mechanics (2016), vol. 807, pp. 324-352. Part of my research involves the theoretical modeling and simulation of developing flows in the entrance and exit regions of a curved pipe. In particular, I have developed asymptotic analytical solutions for the developing flow in a curved pipe and for the transitioning flow downstream of a curved pipe. More recently, I am working to develop an analytical solution governing the spatial decay of any general 3D pipe flow perturbation. Ault, J. T., Chen, K. K., and Stone, H. A. Downstream decay of fully developed Dean flow. Journal of Fluid Mechanics (2015), vol. 777, pp. 219-244. Ault, J. T., Rallabandi, B., Shardt, O., Chen, K. K., and Stone, H. A. Entry and exit flow in curved pipes. Journal of Fluid Mechanics (2017), vol. 815, pp. 570-591. The resolving power of three-dimensional particle velocimetry techniques is critical to our ability to understand and visualize complex flow structures in microfluidic and biological systems. 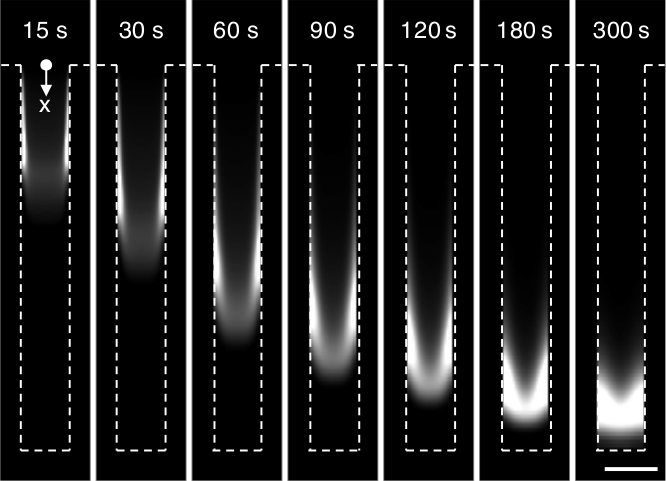 We proposed and demonstrated a simple technique for measuring volumetric particle information with microsecond time resolution. This technique utilizes a fast varifocal lens in a modified wide-field microscope to capture volumetric and planar information. We demonstrated this technique on the complex, three-dimensional laminar flow at a branching, arrow-shaped junction. By integrating a TAG lens with a scanning frequency of 70 kHz with a wide-field microscope, we acquired images through the depth of the scanning volume every 7.1 microseconds. This single-camera imaging system provides a simple and economical means of high-speed three-dimensional flow visualization. Chen, T.-H., Ault, J. T., Stone, H. A., and Arnold, C. B. High-speed axial-scanning wide-field microscopy for volumetric particle tracking velocimetry. Experiments in Fluids (2017), vol. 58, no. 5, pp. 41. Another project that I worked on involved using experiments, modeling, and numerical simulations to study imbibition from a point source into a dry homogeneous aqueous foam. The dynamics is driven by the capillary pressure in the liquid microchannels of the foam (Plateau borders) and is resisted by both viscous and gravitational forces. Specifically, we showed that the imbibition front tends to flatten out over time due to gravitational effects, an effect which can be quantified through the use of the Bond number, which compares the gravitational effects to the capillary pressure. We concluded that both the ratio between the oil-water and air-water interfacial tensions and the Bond number together determine the imbibition efficiency. Mensire, R., Ault, J. T., Lorenceau, E., and Stone, H. A. Point-source imbibition into dry aqueous foams. Europhysics Letters (2016), vol. 113, no. 4, pp. 44002. Another project that I have worked on involves the locomotion of catalytic nanomotors. Synthetic nanomotors are frequently being developed in an attempt to better understand and/or mimic nanoscale biomotors that are present in biological systems. Bimetallic nanomotors have been created which can swim many body lengths per second as well as pick up, manipulate, and drop off microscale cargo under the action of applied magnetic fields. We studied the short- and long-time diffusivities of gold/platinum coated bimetallic nanomotors, and compared the motors' behaviors with Brownian dynamics simulations and analytical theory. Marine, N. A., Wheat, P. M., Ault, J. T., and Posner, J. D. Diffusive behaviors of circle-swimming motors. Physical Review E (2013), vol. 87, no. 5, pp. 052305. One issue that I am especially passionate about is water scarcity. According to the World Health Organization, nearly 1 billion people do not have reliable access to safe drinking water. 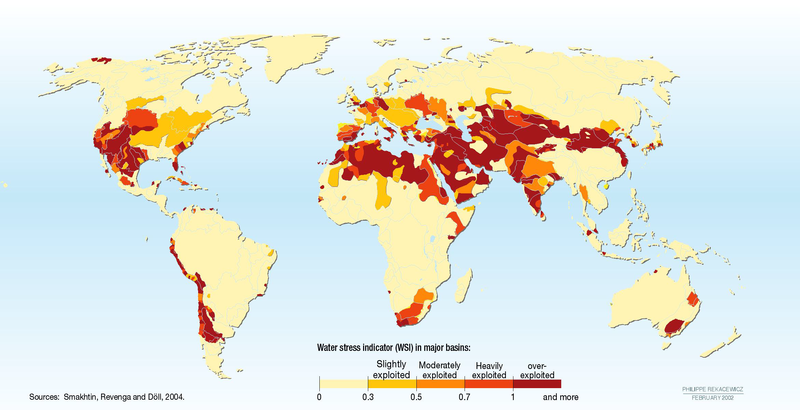 The water scarcity index reported by the United Nations Environment Programme shows that many millions of people live in regions where water use exceeds minimum recharge levels. One project that I worked on was to redesign a simple solar still to enhance efficiency. Our specific approach involved using superhydrophilic Boehmite-coated aluminum wire meshes to create thin film continuous flows which can potentially enhance evaporation rates and therefore improve efficiency and production rates of solar stills.